BBCC staff was very accommodating and helpful while working out the details of my wedding. They were open to my wishes and changes and the whole event went smoothly and looked beautiful. I felt really comfortable while planning and confident the day would turn out great. They met every expectation I had, I would highly recommend hosting an event or wedding here. Thank you so much for the positive review. We take any and all critiques to help better our service and our staff. We cannot wait to host another event for you in the future! I had a great experience working with Brett. He was a great help when it came to creating my menu. He knew exactly how much food I would need, etc. The food was delicious. The staff were friendly and attentive. I will definitely go back there again for any future events. They strive to make your event a success! Extremely helpful with ideas and very accommodating. Food is excellent! I have had 3 events there with a large group (52-69) people and everyone has been please with everything. Plan to be back next year. Our wedding was wonderful! The food was great and all of our guests had an enjoyable evening! Many thanks to Brett and everyone at Broad Bay for helping us plan and create a great wedding!! We celebrated our fiftieth anniversary and our daughter's wedding at the same affair. We had our daughter's wedding and our fiftieth anniversary on the same day and were quite pleased with the way both functions came together as one. We could not have had such a fantastic evening without Brett's suggestions, his guidance, and his superb organizational skills. He is the Best at his job! Thanks to Brett and his staff, our daughter and my husband and I have a day to happily remember forever. The venue was good. I had wanted to be inside the club, but we were pleased that the tent worked out well. My only suggestion is that if you have food stations in the tent, you move them far apart so it does not appear to be a buffet line. Overall, my daughter, my husband, my new son-in-law, and I had a wonderful evening. So we are planning to have our wedding here 5/28/15. We have been working with Amanda who has been AWESOME!! Super accommodating to our requests. She was very friendly and personable. The place was very nice and has great outdoor space. Look forward to our wedding here. Will post another review after. My best advice if you are looking for a great venue is go to Broad Bay Country Club! The entire staff, Brett, Tim, bartenders and waiters/waitress, all were total professionals. They took care of all the details and listened to our needs. The chef is amazing and our buffet was outstanding. Everyone commented on the quality of the food! OUTSTANDING! Go talk to Brett!! We had our ceremony outside, dinner inside and then back outside for dancing and a night of fun! Wonderful venue! I had my deceased husband's Celebration of Life at Broad Bay in April of 2016. Everything was perfect- the room set up, the waitors.waitresses, the drinks and especially, the food - everyone raved about the great presentation and food. It was certainly a sad reason for a "get together" but it went so well and I was so pleased. Brett and his staff are to be commended on the excellent Celebration. I would highly recommend Broad Bay for any of your events!! Great staff from Amanda & the chef to all the assistants and the golf pro. 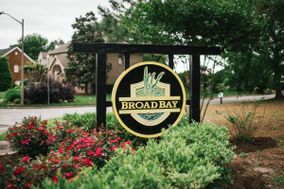 The team here at Broad Bay Country Club is thrilled to hear such good feedback, we are always delighted to hear that everything was outstanding for a party. We cannot wait for the chance to host another event for you in the future! We love the venue--the room is spacious with a view of the golf course, and the staff is warm and helpful without being obtrusive! at the start of the party, most of the guests arrived at the same time. there was only one bartender. He was also serving the normal Friday night club customers. We requested additional help which should have been expected by the club. This was taken care of quickly, but still caused a long line of people waiting for a drink. This was a birthday party, not a wedding. Unable to fill this out properly. Everything ran like clockwork - no problems whatsoever. Food quality was excellent and staff was friendly and responsive. Broad Bay was the perfect fit for my special day. They worked with me every step of the way. My now husband went to check the place out while I was at work and they both loved it. My husband did not seem to like any of the other places we had visited and I was starting to worry. The staff was more than accommodating and friendly. We came at a weird time where they were finding a new food & beverage coordinator so another member of their staff, Tim, stepped in. He was extremely friendly and made us feel like it was truly a day to celebrate us. We liked them so much that we smoked some meats and brought it for them to enjoy. Between Brett and Tim the two of the coordinated exactly what we needed. I was able to bring in anything I wanted for decorations. The food was top notch and I could not believe how delicious it was. They truly made my wedding day perfect. The only issue I had was that patrons got charged a 20% tip on each drink bought at the bar. That's just not right. bartenders would have probably made more tips if left up to the patrons. Aside from that, the food was wonderful (as usual) and the service was great. The team here at Broad Bay Country Club is thrilled to hear such good feedback, we are always delighted to hear that everything was outstanding for a party. In regards to the gratuity, it is standard practice here to charge a 20% gratuity across the board for all events that are held here. Brett at Broad Bay Country Club was a pleasure to work with. We had our wedding reception at the club. Prices were reasonable. The BBCC team was very helpful with planning meetings in advance, as well as set up details on the day as our family arrived from the wedding at a different location. Our group was very satisfied with Broad Bay Country Club and would definitely use them again. There was a little confusion with the service but nothing that would prevent us from going there again. The food was wonderful. We had 120 golfers and ran out of chicken twice. they also wanted to charge us for 130 dinners. also they tried cancelling one of the beverage carts with an hour to go. On the golf side everything was outstanding. could not have pulled off a great event without Brian and his staff. Thank you so much for the review. We take any and all critiques to help better our service and our staff. The issues listed were addressed the day of the event so we hope that you were happy overall. Please reach out if there is anything we need to further address. We cannot wait to host another event for you in the future! The manager was extremely rude and unprofessional. It was extremely hot during the entire reception and all my guest left drenched in sweat due to the AC not working. I didn't get the time we agreed upon in my contract and my wedding reception was abruptly interrupted and stopped. A bill was literally thrown at me at the end of the reception with a list of charges that I had already paid for. I still give the quality of service 3 stars because the wait staff was phenomenal. I hate that they have to suffer for the acts of the manager. I am very sorry for the experience you had. We’re normally known for our exceptional attention to detail, and we regret that we missed the mark. We know that the AC was an issue that night and even though it was hot that night we were sure to have it looked at and fixed. If there is anything else we can do please let us know. Event coordinator was difficult to get a hold of during the planning process. Food was left untouched by our guests due to poor placement (inaccessible). Construction noise and no A/C. Charged $87.50 for self serve ice water and ~2 gallons of unsweet tea. Miscommunication led to our guests paying for their own drinks against our request. Was refunded quite a bit to remedy our poor experience at this venue. Disappointing venue. Waitress did a great job serving 20 guests independently. Kirstie, I am very sorry for the experience you had. We’re normally known for our exceptional attention to detail, and we regret that we missed the mark. We know that the AC was an issue that night and even though it was hot that night we were sure to have it looked at and fixed. Our General Manager did reach out and hopefully righted all the wrongs of that night. If there is anything else we can do please let us know.